Gr 8 Up—Every summer, Rose and her parents vacation at a lakeside cottage. The rest of the world fades away as Rose reunites with her friend Windy and delves into leisurely games of MASH, swimming, and the joy of digging giant holes in the sand—but this summer is different. Rose is on the cusp of adolescence; she’s not ready to leave childhood behind but is fascinated by the drama of the local teens who are only a few years older, yet a universe apart in terms of experience. They drink, they smoke, they swear. As Rose and Windy dip their toes into the mysterious waters of teen life by experimenting with new vocabulary (“sluts!”) and renting horror movies, her parents struggle with their own tensions that seem incomprehensible to Rose. Layers of story unfurl gradually as the narrative falls into the dreamlike rhythm of summer. Slice-of-life scenes are gracefully juxtaposed with a complex exploration of the fragile family dynamic after loss and Rose’s ambivalence toward growing up. The mood throughout is thoughtful, quiet, almost meditative. The muted tones of the monochromatic blue-on-white illustrations are perfectly suited to the contemplative timbre, and the writing and images deserve multiple reads to absorb their subtleties. 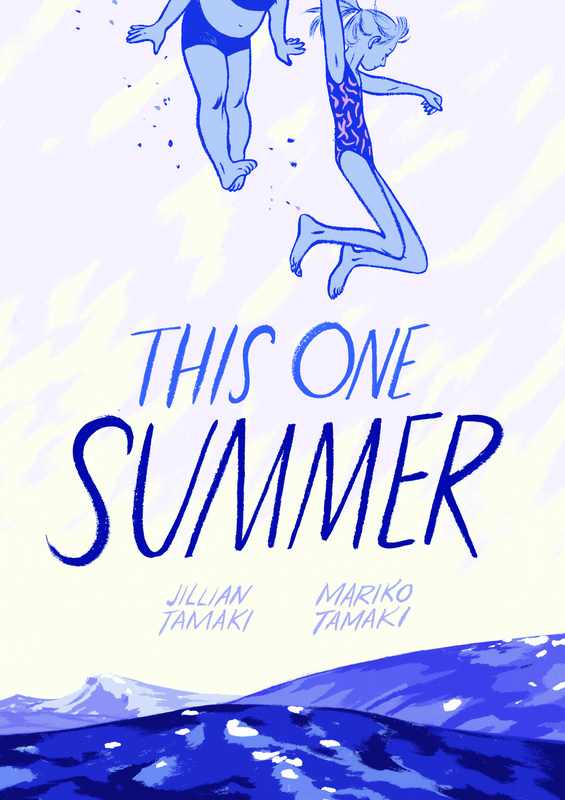 This captivating graphic novel presents a fully realized picture of a particular time in a young girl’s life, an in-between summer filled with yearning and a sense of ephemerality. The story resolves with imperfect hope and will linger in readers’ mind through changing seasons. Previous Post Is Robotic Journalism Going to Give Us the News Now? Next Post More NY TIMES Bestsellers for First Second!